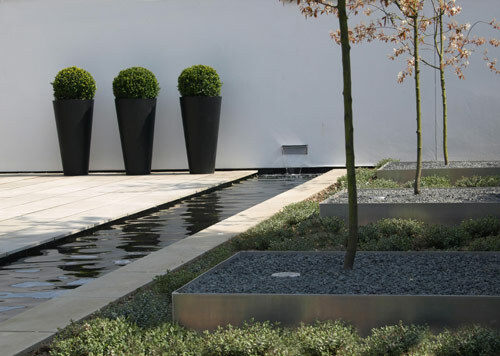 We don't talk much about Modern garden designs in the Pottery Post blog but today we thought we would share some thoughts and see what you think. Since modern garden designs are generally geometric, abstract, and use little plant materials they are not what most would consider when designing a patio or yard area. Mostly contemporary they are designed in the minimalist approach where less is more. 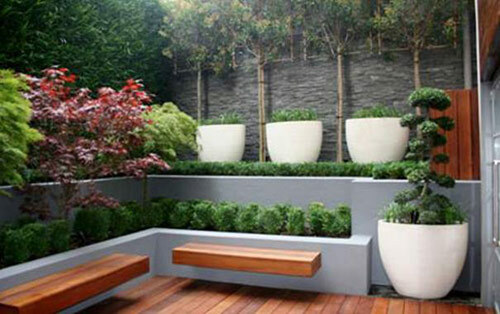 The garden containers used now become the main focus with artistic touches or where opposite happens and the plants are the accent point and the pottery is mostly hidden and minor. It's not that you don't like traditional gardens and landscaping it's that you desire a more simple, feel and look that reflects your personal desire for outdoor living. 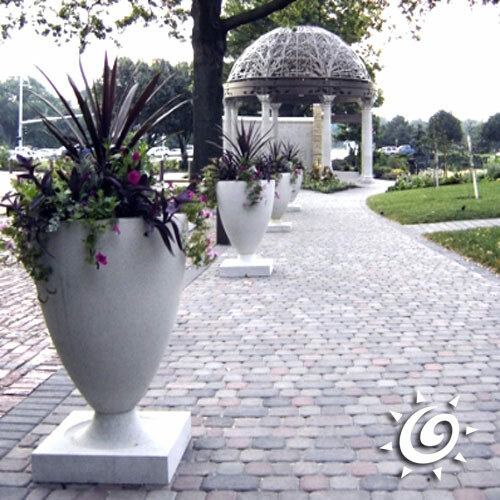 Since many modern garden containers can be cold, abstract and plain looking they will need a plant that will add something to the design element. Like for an example a concrete wok planter with no pattern or even rolled rim edges is fairly simple and plain. 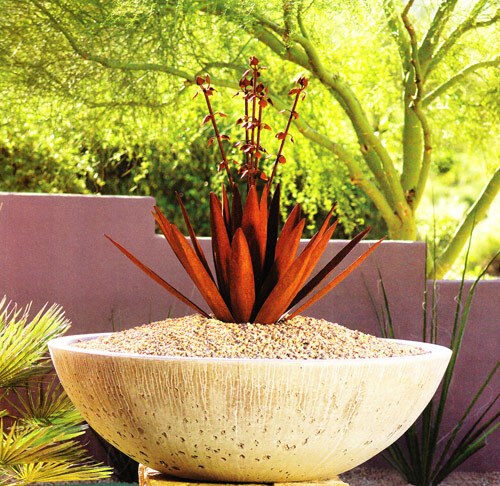 But place a spiky cactus or succulent in the center and it can explode out the top creating a lively display. 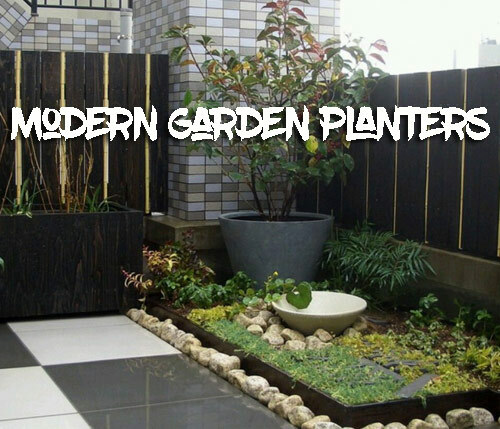 Try to consider a Modern garden container a joining of two design elements. Simple, plain, abstract all matched with color, unique plants and minimal displays. Usually you wont see a lot of plant materials mixed but a few displayed distinctive. Plants are not just tools meaning just stick one into a pot and hope for the best. Try to provide a variety of choices that make sense. Example - different succulents, all colorful flowers or evergreens with no color. Instead of just trying to fill space think of modern designs as an art form. Maybe use a few garden containers that stand tall, proud and empty. Display them as artwork instead of a garden planter. A cigar jar shape usually fits this need. Size matters here. You do not want a small planter sitting in the center of a display that is undersized and gets lost in the surrounding plant materials. Lastly, when starting out a great place to begin your planning is visualizing the term "Negative Space". This means the space between things. It truly creates a space for the mind and the eye to rest because it is the area where the lest is going on. It allows you to be able to sit there and breathe. There are no hard rules when it comes to designing this way. Just take a deep breathe and get creative. [Read More] Potted Jasmine to Help You Sleep.